’Tis the season for an unconventional take on relationships in Bollywood. 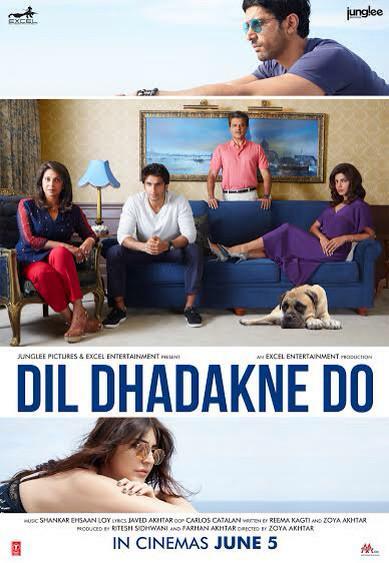 Just weeks after director Shoojit Sircar’s Piku came to theatres with the story of an exasperating father and his indulgent daughter, Zoya Akhtar brings us Dil Dhadakne Do (DDD) which revolves around a philandering opportunist, his doormat of a wife who is too hypocritical or perhaps too lethargic to shake him off, and the two children they’re both bent on suffocating. The standard term for such folk these days is “dysfunctional family”, but that begs the question: which family is not? Anil Kapoor in DDD plays Kamal Mehra, an industrialist keeping up the appearance of wealth with an extravagant lifestyle even as his company teeters on the brink of bankruptcy. He cheats on his wife Neelam (Shefali Shah) who too is obsessed with maintaining a façade of happiness. Both prioritise this outward show and the survival of the business over even their kids’ welfare. Matters come to a head on a 10-day cruise to Europe organised for relatives and friends to mark the Mehras’ 30th wedding anniversary, with the children – Ayesha (Priyanka Chopra) and Kabir (Ranveer Singh) – rebelling against their oppressive, dictatorial parents. For the record, Ayesha is a successful businesswoman in her own right, living in Mumbai with her husband Manav Sangha (Rahul Bose) and mother-in-law (Zarina Wahab), while Kabir works for his father’s company and lives in the family home in Delhi. From her very first film, Zoya Akhtar has shown a penchant for a naturalistic style of storytelling. Events in both Luck By Chance and Zindagi Na Milegi Dobara flowed at what felt like a pace that mirrors real life, without contrived attempts at twists and turns to heighten the melodrama. Ms Akhtar is part of a small but expanding band of Bollywood film makers whose works remind us that drama is intrinsic to all relationships and there is no need to artificially up the ante for effect. DDD follows the same route, with just one difference: a crazy, slightly silly (and confusing) climax that appears improbable on the face of it, but is so clearly deliberately designed to unapologetically be what we call “filmi” that I suppose it works as a kinda sorta cheery ode to conventional Bollywood madness. At almost 171 minutes, DDD is longer than most Hindi films are these days. It is to the credit of Akhtar and the pace she sets from the word go, that not one of those is a minute of flab. Each member of the film’s star-studded cast – including supporting players Anushka Sharma, Farhan Akhtar, Rahul Bose and Zarina Wahab – and every single character get their due, without the effort to do justice to them appearing heavy-handed in any way. Even the narrator Pluto Mehra works for the most part, not counting one somewhat preachy portion where he discusses differing social attitudes towards men and women who sleep around. But you know what, when you are that huggable, you are allowed one passing slip-up. Aiding the director in maintaining her engaging narrative is the superlative cast. Anil is superb while striking a fine balance that calls for him to be despicable yet hard to hate. It is a challenging role but he plays it as if it is who he really is. God bless this era in Bollywood when a senior actor of his stature can get the role of a hero in a film without having to degrade himself by playing a character much younger than his real-life age. When a veteran is on a roll, it’s tough to avoid being overshadowed, but Ranveer manages that feat, delivering a remarkably controlled and nuanced performance as Kabir. It helps that he has an incredibly appealing screen presence which he puts to good use here. This is a young man who is both a born actor and a born star. The story belongs to these two gentlemen, not because they get more screen time – they do not – but because they have more interesting, layered characters. Despite the disadvantage, Shefali and Priyanka shine as conflicted women, although it requires a considerable suspension of disbelief to digest a 42-year-old Shefali playing Mom to actors who are 29 (Ranveer) and 32 (PC). Can you imagine a male star of the same age – say, John Abraham – playing father to those two?! In MCP Bollywood, even in a liberal story like this one, that would be unthinkable! The most charming, endearing relationship in this film filled with relationships is the brother-sister bond. Kabir and Ayesha’s unflinching support for each other and perfect understanding of each other is enough to warm the stoniest heart. It is also nice to see two major mainstream stars playing siblings rather than a romantically involved couple. The last time I remember that happening was with Shah Rukh Khan and Aishwarya Rai in Mansoor Khan’s Josh. That casting decision is one of many reasons why DDD is an unconventional Bollywood film. Another is that it has four leads – the family quartet – and none is given more importance than the other. DDD is also that rare Hindi film with an ensemble cast. Among the many exciting actors in smaller roles are debutant Ridhima Sud and TV’s Vikrant Massey (from Balika Vadhu among other serials) who earlier played Ranveer’s friend in Lootera. The two make their mark as offspring of warring families who are among the Mehras’ invitees on their anniversary cruise. In its own way, DDD is also a gentle slap in the face of misogynists who stereotype feminists as being: (a) only women and (b) people who overlook the flaws of women. Quite to the contrary, the two great feminists of this film are Kabir and Sunny, Ayesha’s old flame played by Farhan. While Kamal Mehra and Manav Sangha are skewered for lording it over their wives, the women are not let off for allowing themselves to be manipulated when they had a choice to do otherwise. I wanted to applaud – actually, I did – when Kabir calls out his mother’s cowardice in pretending that she was unaware of her husband’s affairs. It reminded me of Amitabh Bachchan’s character Bhaskor in Piku pointing out to his sister-in-law that her frustrations about her life of professional non-achievement were her fault since it was she who chose – despite Bhaskorda’s encouragement and cooperation – not to take up a job which offered her a pay higher than her husband’s salary. Let us not forget that patriarchy survives on the collaboration of such women. Another noteworthy aspect of DDD is the absence of community stereotyping. The Mehras are Punjabis but hey look Bollywood – they do not yell “Balle balle” or break into the Bhangra at the drop of a hat. Imagine that! Of course there is a tiny bit of gender stereotyping elsewhere: the gossips in the film are all women, their men are never shown gossipping. C’mon Zoya, you know better than that! Music directors Shankar-Ehsaan-Loy deliver a relevant and pulsating background score although a majority of the songs in DDD are disappointingly tuneless. Pehli Baar is the only somewhat memorable melody of the lot. Oddly enough, despite this I enjoyed all the songs within the framework of the film because they fit the situations in which they come up and because the choreography is thoroughly enjoyable, atypical Bollywood. Particularly worth mentioning are the Broadway-style Girls like to swing featuring a cute-as-a-button Anushka who reminded me of Renee Zellwegger in Chicago and the infectious energy of Gallan Goodiyaan in which the entire supporting cast – yes all of them – throw themselves into the dancing with a joie de vivre that is irresistible. Who knew that Rahul Bose and Parmeet Sethi could swing like that? You go, boys! And what a joy to see a grey-haired Anil dancing wildly in that same song. DDD is not faultless, but barring that nutty ending, I had a rollicking good time watching it because it is funny, believable and sweet, the cast is lovely and most of all, because now that I’ve seen it, I’ve fallen in love with both Ranveer Singh and Anil Kapoor. PS: Good job with the guest appearance, Aamir. while i do think its wrong for Shefali to be playing Priyanka and Ranveer's mom, and while I don't like the fact that male stars get to romance women half their age, I don't really need to suspend belief in me seeing her play their mom. It looks believable to me. If I didn't know I her age, I would have never guessed she was only ten years younger than Priyanka.